Come and explore with us the hidden beauties of our deep green island. We will make a tour in the inner part of Thassos gazing the wild locations and the amazing view. We start at 9.00 from the capital of the island, Limenas. Our first stop will be Kastro, a village with no population but with a history of 600 years. There we will visit the chapel of Prophet Ilias where we will see the bone crypt of the village. 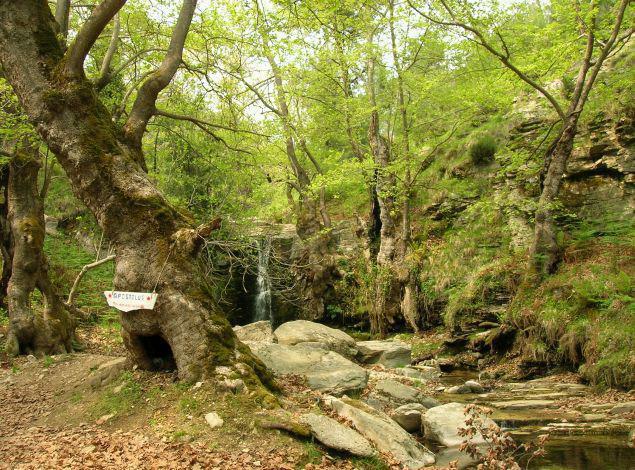 Next we will head to “Apostoloi” waterfall which is surrounded from enormous plane trees. Our next stop is the Refuge at 910 m. with a fantastic view to Golden Beach. We are going to have a barbeque here with souvlakia, salads, tzatziki, refreshments and coffee. After lunch, we will reach the highest pick of the island at 1206 m., Ipsario. From there, you can see all the island and its 100 km perimeter, the island of Samothraki, Kavala and sometimes the island of Limnos. At southwest you can see Mt. Athos. At the north you can spot the main land and the delta of Nestos river. Our last stop will be the technical lake of Maries and the small waterfalls nearby. At the end of the day you will have a complete image of the inner and outer parts of Thassos, and realize why it is called the Diamond of the North.